Sir Thomas Mostyn, 4th Bt. Sarah Western was the daughter of Robert Western. She married Sir Thomas Mostyn, 4th Bt., son of Sir Roger Mostyn, 3rd Bt. and Essex Finch, in 1735.1 She died on 28 May 1740. Her married name became Mostyn. 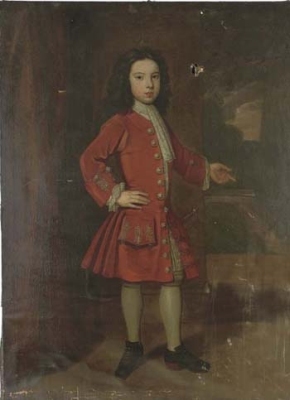 Child of Sarah Western and Sir Thomas Mostyn, 4th Bt. After her marriage, Essex Mostyn was styled as Countess Ker of Wakefield on 16 June 1739. From 16 June 1739, her married name became Ker. After her marriage, Essex Mostyn was styled as Duchess of Roxburghe on 27 February 1740/41. Robert Ker, 2nd Duke of Roxburghe was born circa 1709.1 He was the son of John Ker, 1st Duke of Roxburghe and Lady Mary Finch.1 He married Essex Mostyn, daughter of Sir Roger Mostyn, 3rd Bt. and Essex Finch, on 16 June 1739.3 He died on 20 August 1755. Lady Mary Finch was born in 1701.1 She was the daughter of Daniel Finch, 7th Earl of Winchilsea and Hon. Anne Hatton. 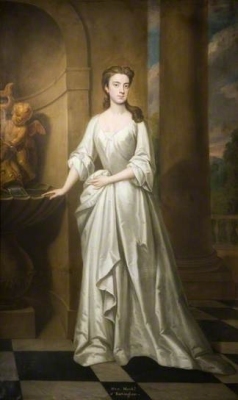 She married Thomas Watson-Wentworth, 1st Marquess of Rockingham, son of Hon. Thomas Watson-Wentworth and Alice Proby, on 22 September 1716. She died on 30 May 1761. Her married name became Watson-Wentworth. [S6] G.E. Cokayne; with Vicary Gibbs, H.A. Doubleday, Geoffrey H. White, Duncan Warrand and Lord Howard de Walden, editors, The Complete Peerage of England, Scotland, Ireland, Great Britain and the United Kingdom, Extant, Extinct or Dormant, new ed., 13 volumes in 14 (1910-1959; reprint in 6 volumes, Gloucester, U.K.: Alan Sutton Publishing, 2000), volume XI, page 60. Hereinafter cited as The Complete Peerage. After her marriage, Lady Henrietta Finch was styled as Duchess of Cleveland on 22 January 1731/32. Her married name became Fitzroy. [S6] G.E. Cokayne; with Vicary Gibbs, H.A. Doubleday, Geoffrey H. White, Duncan Warrand and Lord Howard de Walden, editors, The Complete Peerage of England, Scotland, Ireland, Great Britain and the United Kingdom, Extant, Extinct or Dormant, new ed., 13 volumes in 14 (1910-1959; reprint in 6 volumes, Gloucester, U.K.: Alan Sutton Publishing, 2000), volume III, page 283. Hereinafter cited as The Complete Peerage. [S2] Peter W. Hammond, editor, The Complete Peerage or a History of the House of Lords and All its Members From the Earliest Times, Volume XIV: Addenda & Corrigenda (Stroud, Gloucestershire, U.K.: Sutton Publishing, 1998), page 187. Hereinafter cited as The Complete Peerage, Volume XIV. He was Comptroller of the Seal and Green Wax office.2 He was Receiver General of the Profits of the Seals in the King's Bench.2 He succeeded as the 3rd Baron Nonsuch, co. Surrey [E., 1670] on 9 September 1730.2 He succeeded as the 3rd Earl of Southampton [E., 1670] on 9 September 1730.2 He succeeded as the 3rd Duke of Cleveland [E., 1670] on 9 September 1730.1 He succeeded as the 2nd Duke of Southampton [E., 1675] on 9 September 1730.1 After his marriage, William Fitzroy, 3rd Duke of Cleveland was styled as 2nd Baron of Newbury, co. Berks [E., 1675] on 9 September 1730.1 He succeeded as the 2nd Earl of Chichester [E., 1675] on 9 September 1730.1 His last will was dated from 27 September 1763 to 1 March 1771. [S6] G.E. Cokayne; with Vicary Gibbs, H.A. Doubleday, Geoffrey H. White, Duncan Warrand and Lord Howard de Walden, editors, The Complete Peerage of England, Scotland, Ireland, Great Britain and the United Kingdom, Extant, Extinct or Dormant, new ed., 13 volumes in 14 (1910-1959; reprint in 6 volumes, Gloucester, U.K.: Alan Sutton Publishing, 2000), volume III, page 195. Hereinafter cited as The Complete Peerage. [S6] Cokayne, and others, The Complete Peerage, volume III, page 283.